Finishing the 2200# pre-drilled float kit. Since bringing float production back to Canada (see History), Zenair has re-designed and improved its larger 1700#, 2200# and 2500# floats. These three floats sizes are very similar in concept and the #2200 & #2500 use identical parts for the wheels/gear and hydraulic system (the #1700 are only available as "straight" floats). The main difference between these floats is in the depth of the bulkheads which changes the buoyancy of the floats. Main wheel tires are MASSIVE at 18.5" diameter and 600x6 wheel hubs are used for all these float sizes. Nose wheel tire is 10" in diameter. The design loads for the 2500# floats were based on FAR23, so the lighter floats (i.e. the 2200#) are overbuilt and extra tough. Performances, rigging, etc. are very similar to typical certified floats. 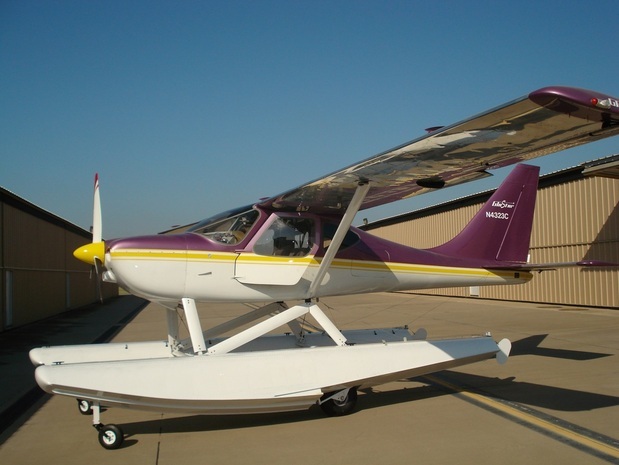 Features that make Zenair floats outstanding include: wheels and gear size, light weight aluminum construction, easy assembly....and yes, they are remarkably affordable! - 6061-T6 aluminum - Top skin thickness is 0.032", and bottom front skin thickness is 0.040". - 3/4"x3/4"x1/8" extrusions are riveted to the bottom sides of the floats. Same extrusions are also riveted to the center of the front bottom skins. - Top walkway area is +8.5" wide making it easy to walk on the floats. - Option of using a special sealed Stainless Steel pull rivet or standard solid rivets. However, in both cases, standard solid rivets are used on the extrusions and keel so as to maximize strength. - Heavy duty 2"x2" extruded aluminum arm moves the wheels up & down. - Nose wheel hubs are sealed bearings and treated aluminum. - Tires are extra large at 10” diameter. - 600x6 heavy duty hub with brakes. 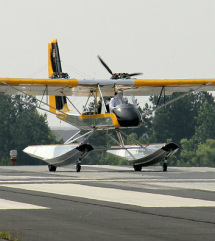 - Tire used is extra large at 18.5” diameter, making it the best floats for grass strip landings. - Gear system is connected to 2 bulkheads for extra strength. Bulkheads are 0.032 thick aluminum and reinforced with 11/2"x1"x1/8” thick extrusions. - The electrically powered unit weight is about 6 lbs and can be installed just about anywhere in the fuselage which can aid in establishing proper CG position. Power unit is operated by a 3 way switch mounted on the instrument panel. 2 flexible high pressure nylon type hoses run from the pump to each float. - The mechanical pump has an external hydraulic oil reservoir and does require more time to install. 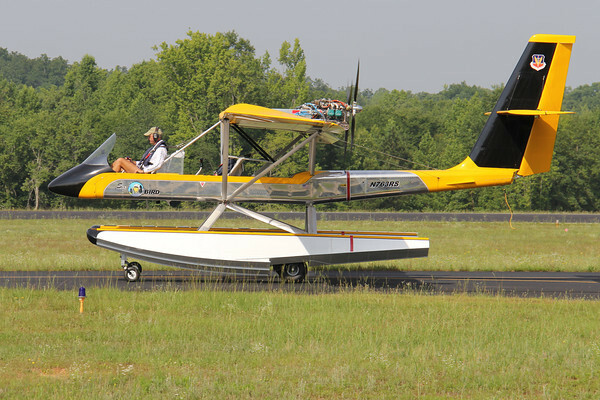 The pump is typically mounted in front of the pilot seat for easy pumping with reservoir in the rear fuselage. Weight is the same as the electric system and same high pressure nylon lines are used. Both systems have a pressure relief valve as to not put too much pressure in the system. In order to maximize the strength of the floats, extrusions are sold riveted with typical AN aluminum type. For customer who really do not want to solid rivet the floats together, Zenair can supply a stainless steel rivet designed for maximum strength but also for water sealing. 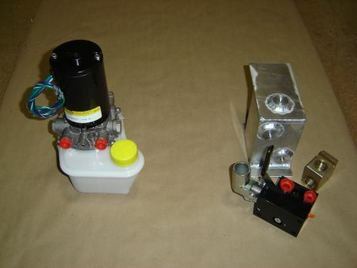 Two high quality hydraulic units are available. Both are compact and lightweight (at 6.5 lbs for electric; 2.5 lbs for manual). The oil tank of the electric unit (left in above photo) is easy to inspect and to fill. Both systems have pressure release valves to make sure that the hydraulic system does not become overloaded. When ordering your floats, specify which unit you want.